WASHINGTON (Army News Service, Jun. 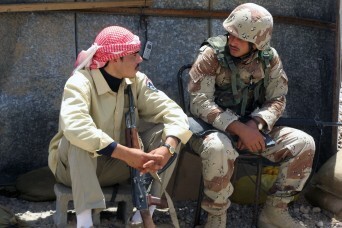 26, 2008) — The Iraqi army has grown by 60 percent in the last year, and stands now at nearly 180,000 soldiers. The army is also now training its own soldiers, and its effectiveness in combat has allowed it to concentrate more on improving logistics and supply chains. Brig. Gen. Steven L. Salazar said that during the last year, the Iraqi army has built up internal momentum and has taken the reins for themselves on many soldier training functions. “More and more the Iraqis are doing training for themselves now,” Salazar said…. And that just ONE B*N*S*N which you can read here.